If you are looking for a natural laundry detergent, that will last you a pretty long time and is actually effective at cleaning your clothes, then Molly’s Suds Original Laundry Powder is the one for you. This stuff has a 4.5 star rating on Amazon, and carries the badge for "Amazon's Choice." On paper, it looks great, but how does it act under pressure? Let's check it out. Powder detergents are making a comeback and Molly’s Suds Original Laundry Powder is leading the charge. It is made up of totally natural ingredients and even holds a handful of certifications. And just in case this one doesn't work out the way you want it to, there are other variations like the sports powder detergent that can handle tougher stains and dirt. Oh, and you can even use this to pretreat clothes by mixing a small amount of the powder with water and putting it on the stain. Turns out, its actually better than the liquid stuff. It is safe for all fabric types except for silk and leather, which need special treatment either way, and is designed for those who are chemically sensitive, have sensitive skin, allergies, or eczema. The ingredients inside Molly’s Suds Original Laundry Powder are totally natural. Not to mention that there is a very small list, which is great to see. Only the essentials are used here, no additives. The complete list of ingredients is a follows: Sodium carbonate sourced from the Green River Basin in Wyoming, sodium bicarbonate, magnesium sulfate (heptahydrate), unrefined sea salt, and organic peppermint (mentha piperita) oil. There are no byproducts here, no harsh chemicals, nothing that poses a potential health risk in any way. And honestly, that is so great to see. While a scent is not particularly needed when it comes to laundry detergents, it is definitely welcome. Many people believe that if your clothes do not come out smelling like flowers or citrus, that means they are not clean. This is not true in the least, but because it has been ingrained in our minds for so long, it is still a good idea to use a fragrance in your detergent, from a business standpoint. So, Molly’s Suds Original Laundry Powder went with a peppermint scent, but got the smell from natural sources, that have no potential risks for you. The best thing about this detergent is that it is completely free of any and all chemicals. Biokleen Laundry Liquid contains no phosphate, chlorine, ammonia, petroleum solvents, butyl, glycol ether, metasilicate, brighteners, SLES or EDTA. There is nothing to worry about in terms of potential health risks. In addition, it is also certified vegan, cruelty free, and has an "A" rating on EWG. 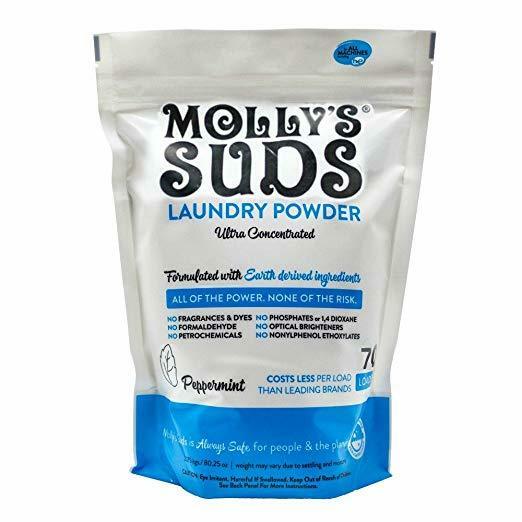 When it comes to buying detergent, Molly’s Suds Original Laundry Powder is about as cheap of a natural detergent as you are going to be able to find. The reason it is so cheap is that you barely need any of it for a large load of laundry. Using one tablespoon of Molly’s Suds Original Laundry Powder is most likely going to be enough. On smaller loads, you can even useless. This translates into using cents per load. The biggest drawback to Molly’s Suds Original Laundry Powder is its effectiveness on stains and smells. It seems that a common complaint is that when tackling very dirty laundry it doesn't quite get the job done. However, Molly's Suds other variations do seem to be better at handling stains and smells. One consumer mentioned that for her kids dirty laundry she uses the Sports variation, and that seems to do the job. Molly’s Suds was founded after the founder's daughter was stillborn. They did a ton of research and found that there are over 80,000 chemicals approved by the TSCA, but only 200 or so were tested for human safety. Because of this, Molly's Suds was born and strives to make a product that is effective, but also safe for humans. Molly’s Suds Original Laundry Powder is natural and biodegradable. When you use Charlie’s Soap, you won’t be adding harmful chemicals to the environment or your septic tank. Molly’s Suds Original Laundry Powder offers a good clean, with a fresh but not overpowering scent. This detergent is great for people with sensitive skin or eczema. This detergent seems to struggle when it comes to tough stains and strong smells. However, it can be fixed with other variations of the product. It seems that many powdered detergents seem to have struggles with tough dirt and stains. This is no surprise really, as when it gets dissolved in the water, it may be too diluted to get the job done effectively. However, for regular dirty laundry, this stuff may be perfect. And from previous reviews for this product, it seems that there are other products from the same brand that get the job done even better. So it may be a good idea to check out the other products Molly's Suds has available. Overall, Molly’s Suds Original Laundry Powder seems to do a decent job with normal laundry. While it may have an issue with tough stains, there are other products by the same brand that can easily get the job done. But if you want to try out this one for yourself, you can grab a bag of this for $13.99 on Amazon. For more information, including the best natural laundry detergent, check out the rest of Green and Growing. Here are some top questions that I found for people seriously considering buying the Molly's Suds Original Laundry Powder. Is this suitable for dark colors? Yes, it works for all colors and fabric types. How should I add this to my laundry? It is best to just add it directly to the water, so it dissolves evenly.